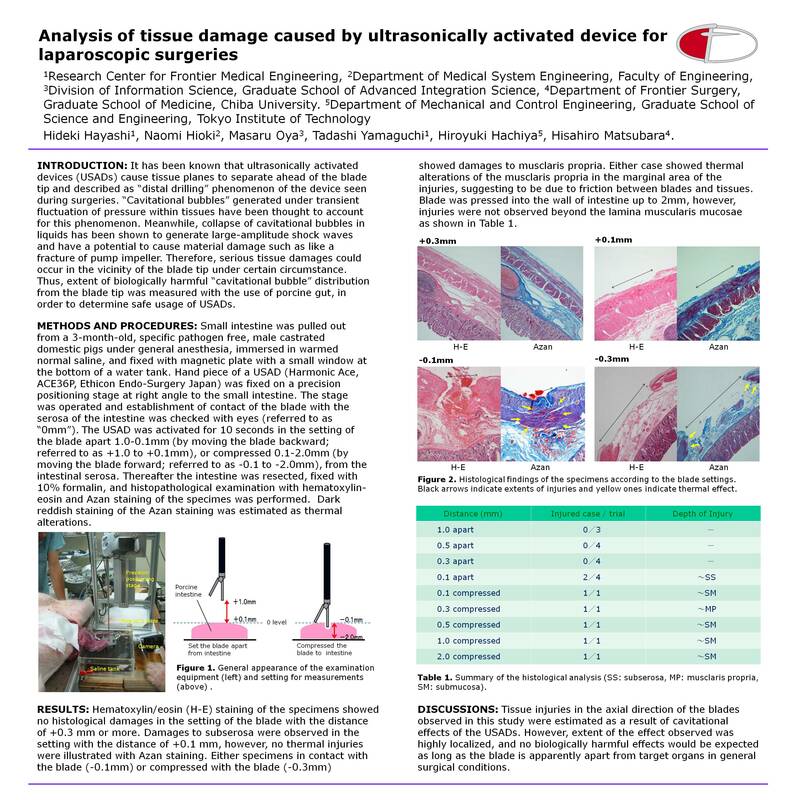 Introduction: It has been known that ultrasonically activated devices (USAD) cause tissue planes to separate ahead of the blade tip and described as “distal drilling” phenomenon of the device seen during surgeries. “Cavitational bubbles” generated under transient fluctuation of pressure within tissues have been thought to account for this phenomenon. Meanwhile, collapse of cavitation bubbles in liquids has been shown to generate large-amplitude shock waves and have a potential to cause material damage such as like a fracture of pump impeller. Therefore, serious tissue damages could occur in the vicinity of the blade tip under certain circumstance. Thus, extent of biologically harmful “cavitational bubble” distribution from the blade tip was measured with the use of porcine gut, in order to determine safe usage of USAD. Methods: Hand piece of a USAD (Harmonic Ace, ACE36P, Ethicon Endo-Surgery Japan) was fixed on a precision positioning stage. Small intestine was pulled out from 3-month-old domestic pigs under general anesthesia, and immersed in warmed normal saline. USAD was activated for 10 seconds in the setting of varying distances between serosa of the intestine and the tip of the blade. Thereafter the intestine was resected, fixed with 10% formalin, and histopathological examination was performed. Results: Hematoxylin/eosin staining of the specimens showed no histological damages in the setting of the blade with the distance of 0.3 mm or more. Damages to subserosa were observed in the setting with the distance of 0.1 mm, however, no thermal injuries were illustrated with Azan staining. Specimens with the setting in contact with the blade showed damages to musclaris propria with thermal injuries to some extent. Conclusions: These data suggested that the effect of shock wave generated in the process of cavitation bubble collapse was highly localized, and no biologically harmful effects would be expected as long as the blade is apparently apart from target organs in general surgical conditions.